Extra heavy-duty super flexible all-weather thermoplastic elastomer cord, 100 ft. long. Superior resistance to oily, moisture, ozone, cracking and are standing for abuse, rough handling and wear. Outdoor use, the lighted connector allows to use where the power is on. Tough cord remains flexible up to 221Fahrenheit and down to -58Fahrenheit. Blue/orange cord. 100 Feet All Weather Contractor Grade Extension Cord 12 Gauge Extra heavy-duty super flexible all-weather thermoplastic elastomer cord, 100 ft. long. Superior resistance to oily, moisture, ozone, cracking and are standing for abuse, rough handling and wear. Outdoor use, the lighted connector allows to use where the power is on. Tough cord remains flexible up to 221Fahrenheit and down to -58Fahrenheit. Blue/orange cord. 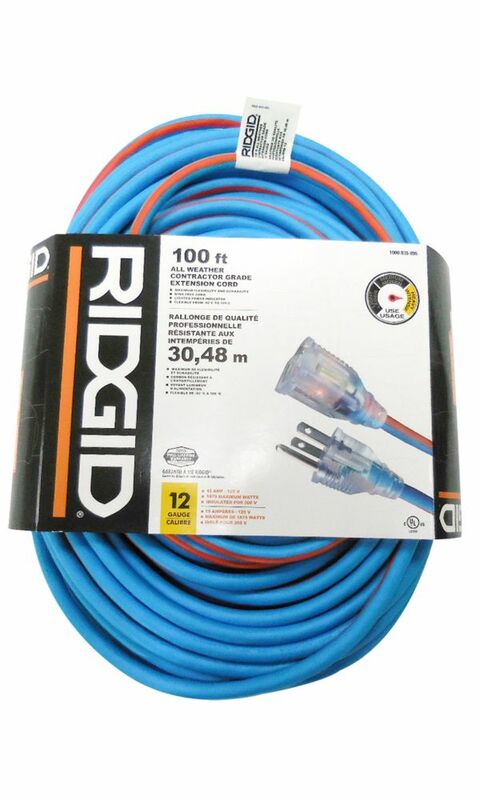 100 Feet All Weather Contractor Grade Extension Cord 12 Gauge is rated 1.0 out of 5 by 1. Rated 1 out of 5 by Snowman from Don't Buy This! USELESS at minus 7 degrees Celsius. Stiffens and must be defrosted every 10 minutes. FALSE SPECIFICATIONS. DO NOT BUY FOR WINTER USE!